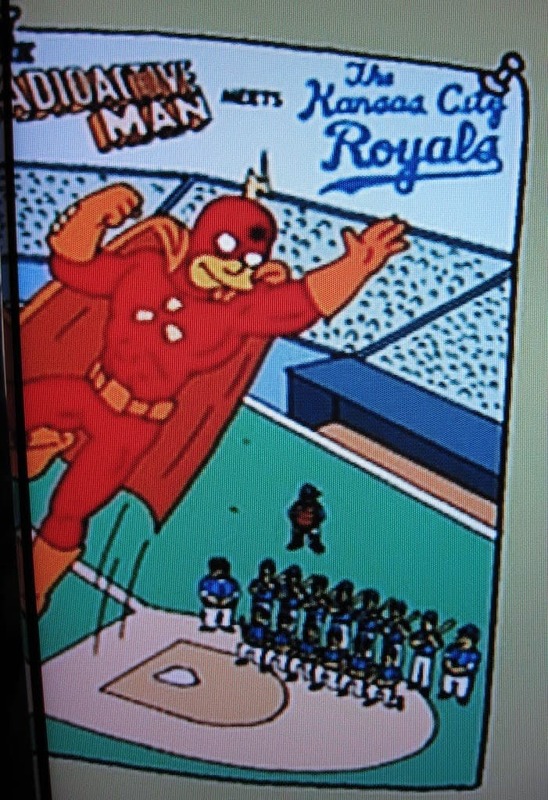 The Simpsons snuck another slight baseball reference into Sunday night’s show that I just caught while watching it on DVR this afternoon. 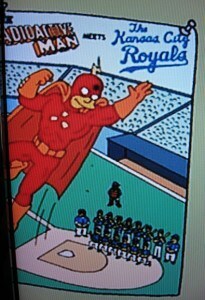 In the above image, tacked to the wall behind Comic Book Guy, is an issue of the Radioactive Man comic: Radioactive Man meets the Kansas City Royals. It’s at least the third baseball reference in the show this season. The biggest, of course, was the “MoneyBART” episode, in which Lisa takes over Bart’s Little League team and makes her decisions based solely on statistics. Wezen-ball.com posted a great recap, focusing on Bart’s game-winning home run. The first baseball reference I caught this season came the week before, in “Loan-a-Lisa,” when Grandpa decides to give the family members their inheritance money so he can see them spend it. When each one only receives $50, Grandpa explains that he lost the rest of it investing in a failed musical about the life of Eddie Gaedel. I couldn’t find a clip online, so I resorted to the rudimentary video recording of the TV. The tripod helps steady it, but the volume may be a bit loud. I overcompensated, not wanting to risk it being too low. It’s been seven years now since ESPN.com’s Page 3 ranked the 100 greatest sports moments on The Simpsons. 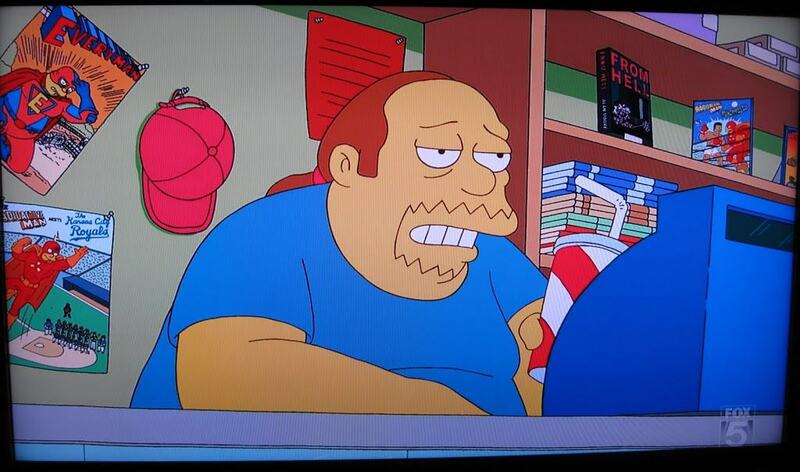 There have certainly been a few more in the years since, but there’s probably no way of knowing how many other minor, throwaway references like these have made it to the show. I’m not sure I’ll ever have the time to dedicate to reviewing each episode on DVD, but if I ever find myself laid up for a month, maybe I’ll start.